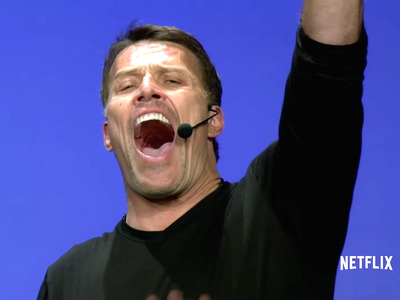 Netflix/YouTubeTony Robbins in the ‘I Am not Your Guru’ trailer. For the first time, Robbins allows cameras into his annual super-seminar, “Date with Destiny.” It’s six days long, with 2,500 participants who are hungry for Robbins’ wisdom and attention. “‘Date with Destiny’ is my favourite event, because it covers the controlling force that controls everything,” Robbins says in voiceover. Netflix promises an inside look at the event’s theatrics and attendees, but also says that the film will unveil the inner workings of Robbins himself. With a reported $480 million net worth, Robbins has been a fixture in the self-help coaching world since the ’80s.